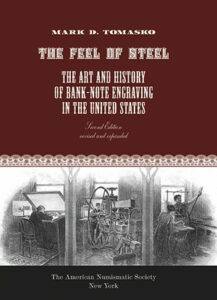 The Feel of Steel provides an unusual look into the two-hundred-year history and the process of bank-note engraving in the United States, a beautiful art brought to its peak in America in the nineteenth century. Part I traces the history, with particular attention to the American Bank Note Company, the small bank-note firms founded after the Civil War, and the Bureau of Engraving and Printing. The decline of the industry in the late twentieth century closes the history. Part II lays out the process of designing, engraving, and printing bank-note-engraved documents. Part II also contains an extended discussion of the artwork origins of the picture engraving, information found in few other places. Part III introduces the members of American Bank Note’s picture-engraving department at thirty-year intervals in the twentieth century, shown in group photographs and with an illustration of each man’s work. This revised edition has 50% more illustrations than the original Bird and Bull fine press limited edition published in 2009. Besides the numerous illustrations (many in color), there are copious notes, a bibliography, and an extensive index, all adding to the volume’s research value. As no book on bank-note engraving would be complete without at least one sample of actual engraving, the frontispiece of the ANS edition of The Feel of Steel is the reprinted title and vignette from a nineteenth-century stock certificate. The reader can therefore actually experience the “feel of steel,” the tactile quality of intaglio printing. Mark D. Tomasko is a collector, writer, and researcher on bank-note engraving, who has written more than thirty articles on the subject, in addition to giving many talks and mounting several museum exhibits.